Statistical Analyst determines analysis parameters, analyzes data, process data and creates visual aids for data interpretation. These professionals are normally expected to shoulder the following roles and responsibilities – analyzing data by employing various tools, models, and algorithms; connecting effectively with quality control to create interfaces for databases with various data; defining, tracking and modeling key metrics or variables and providing recommendations; developing and maintaining program for statistical library like associated documentation; interpreting data analysis to produce results and reports for various audiences. 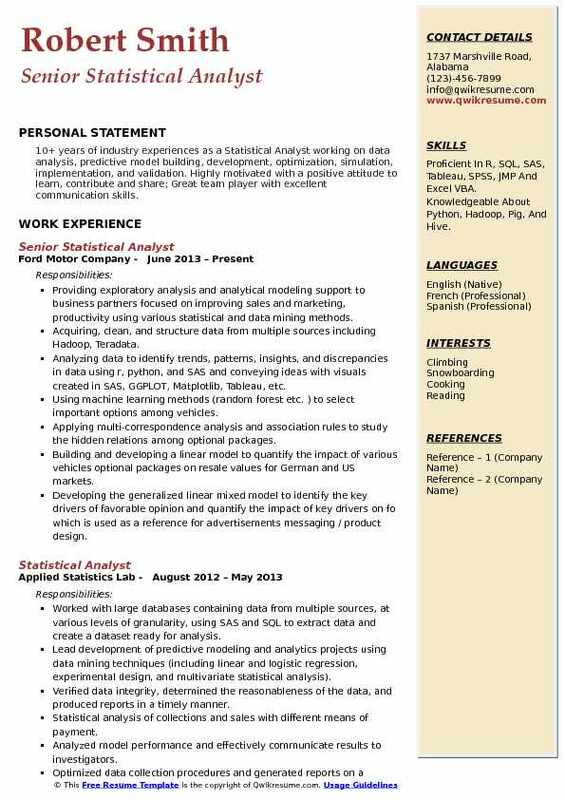 Statistical Analyst Resume should mention skills like data modeling, statistical analysis, and proficiency in SQL, Saas, Database analysis, MS Excel, SPSS and financial reporting. Most of the resumes for statistical Analysts post make a display of a Bachelor’s degree in the field of Economics, Statistics, mathematics, operations research, Quantitative Analysis, Industrial engineering or related field. 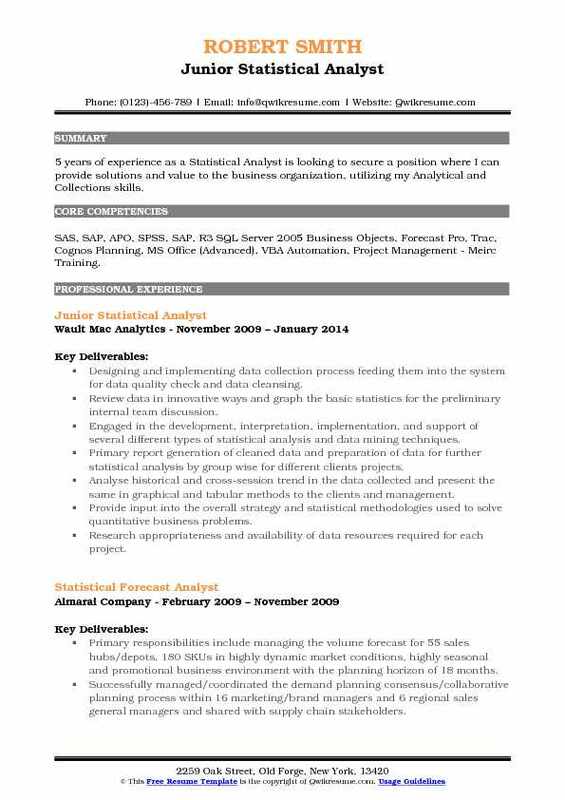 Summary : 13 years of experience as a Statistical Analyst. An organized and efficient professional who is highly skilled in office administration, data entry, and word processing. Seeking an Office/Clerical position in which my customer service, bookkeeping, personal, clerical and general office skills will contribute to greater office efficiency and productivity. Skills : Access, Excel, SAS, Powerpoint, Word, SPSS, 51 WPM Typing Speed, SQL, Python, Microsoft Office, And Matlab. Created and continue to manage excel spreadsheets that produce a weekly and monthly sales analysis. Monitored sales activity on a monthly basis and discussed trends with management. Created excel spreadsheets that keep track of style productivity which allows management to predict future sales. Supports owner through reconciliations of cash, credit card, and cod activity, as well as enter these findings into QuickBooks. Creates files for available inventory to be uploaded onto 2 websites in order to further sales. Investigated and resolved customer inquiries and complaints in a timely and friendly manner. Answers and manages incoming and outgoing calls and politely assisted customers. Responsible for routing deliveries and courier services, and prepares ups and FedEx shipments daily. Works with larger accounts, such as Anthropologie and Saks off fifth, by communicating with their trucking company and preparing goods to go out using their own program. Supervises warehouse management to make sure goods are received properly and sent out appropriately. 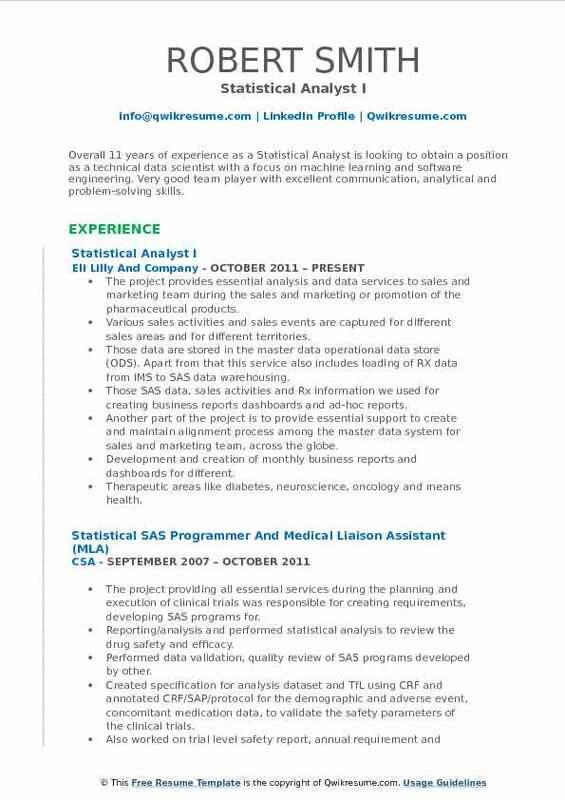 Objective : An analyst with over 3 years of experience in data analysis and visualization. Proficient in various data manipulation software as well as presenting to senior leadership and non-technical audiences. Skills : SAS, R, Outlook, CSS, Deep Learning, Django, ETL, Forecasting, Statistical Data Analysis, Modeling, And Bioinformatics. 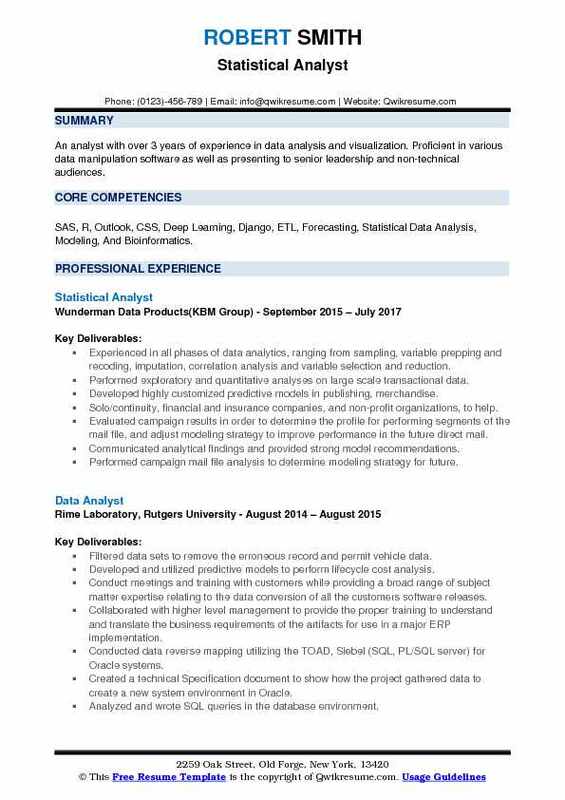 Experienced in all phases of data analytics, ranging from sampling, variable prepping and recoding, imputation, correlation analysis and variable selection and reduction. Performed exploratory and quantitative analyses on large scale transactional data. Developed highly customized predictive models in publishing, merchandise. Solo/continuity, financial and insurance companies, and non-profit organizations, to help. Evaluated campaign results in order to determine the profile for performing segments of the mail file, and adjust modeling strategy to improve performance in the future direct mail. Communicated analytical findings and provided strong model recommendations. Performed campaign mail file analysis to determine modeling strategy for future. Developed predictive logistic regression and decision tree models, back-tested models on prior campaign files, and made recommendations to the sales team. Analyzed donor files to determine best customer profile and develop logistic regression and decision tree models to identify prospective donors for clients upcoming direct. 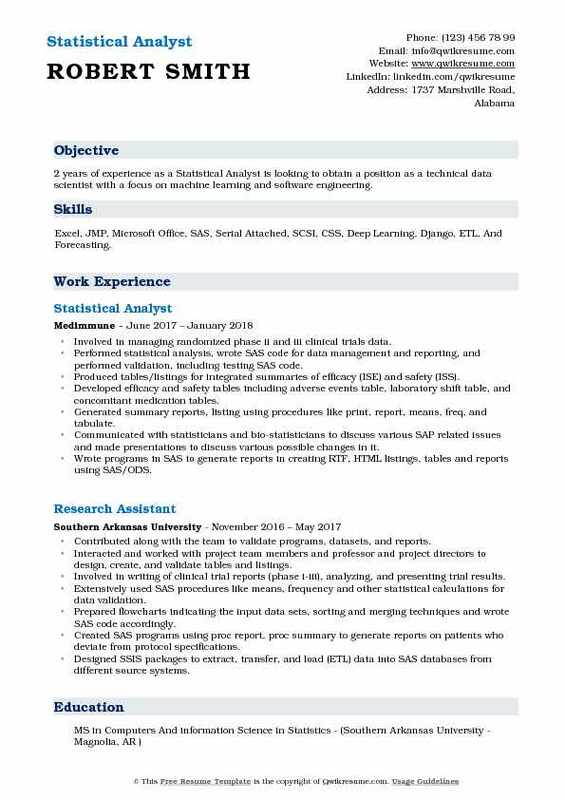 Objective : One year experienced Statistical Analyst specializing in report automation, quantitative research, and white paper reporting. Serving my company and clients by spotting trends and completing projects for sustainable corporate growth. 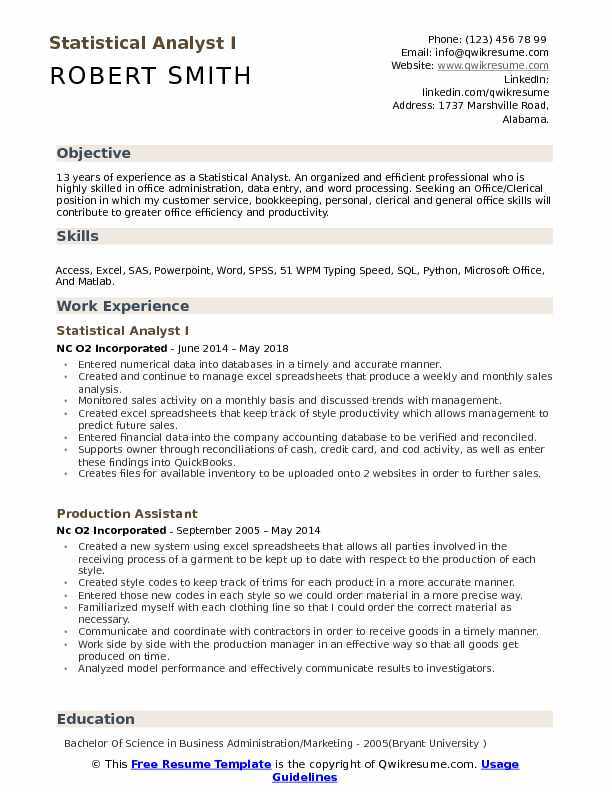 Skills : Word, Excel, And STATA 13 Aptitude Adept Researcher, And Analyst, Passionately Self-motivated, Problem Solver, Decision Maker, Extremely Friendly, Caring, And Professional Proven Leader. Utilize advanced reporting software and quantitative analytics to present data to TN legislature and subcommittees. Managed judge caseload statistics to TN comptrollers office, showcasing judge need per district. Created, automated business intelligence tools, reducing operational labor cost while increasing validity. Project lead on the statistical algorithm for courtroom sentencing and bail hearings providing state benchmarks. Operational data planning with annual TN judicial report to TN legislator influencing TN criminal policy. Increased data collection efficiency by transiting paper collections to the digital space. Automated financial alternative dispute resolution reporting allowing complete user control. Administer surveys and interviewed stakeholders to gain program feedback then designed, effectively communicated the success and tracking metrics to support and track the operational impact. Lead the annual TN judicial report to the TN legislator production influencing criminal policy. Developed user-driven dashboards as in-house project management software to aid chief PMO. Constructing crystal reports to the TN legislature reducing labor by five days per year. Summary : Overall 11 years of experience as a Statistical Analyst is looking to obtain a position as a technical data scientist with a focus on machine learning and software engineering. Very good team player with excellent communication, analytical and problem-solving skills. Skills : Data Manipulation, Data Visualization, Excel, Forecasting, Microsoft Office, SQL, Oracle Developer, R, Python, SAS, SPSS, Minitab, PowerPoint, And Word. The project provides essential analysis and data services to sales and marketing team during the sales and marketing or promotion of the pharmaceutical products. Various sales activities and sales events are captured for different sales areas and for different territories. Those data are stored in the master data operational data store (ODS). Apart from that this service also includes loading of RX data from IMS to SAS data warehousing. Those SAS data, sales activities and Rx information we used for creating business reports dashboards and ad-hoc reports. Another part of the project is to provide essential support to create and maintain alignment process among the master data system for sales and marketing team, across the globe. Development and creation of monthly business reports and dashboards for different. Therapeutic areas like diabetes, neuroscience, oncology and means health. Development and validation of SAS programs to generate the sales business reports for different drugs. Extraction of master data from oracle database using toad to generate and validate. Creation of business design based on the business requirements for outside-us and. 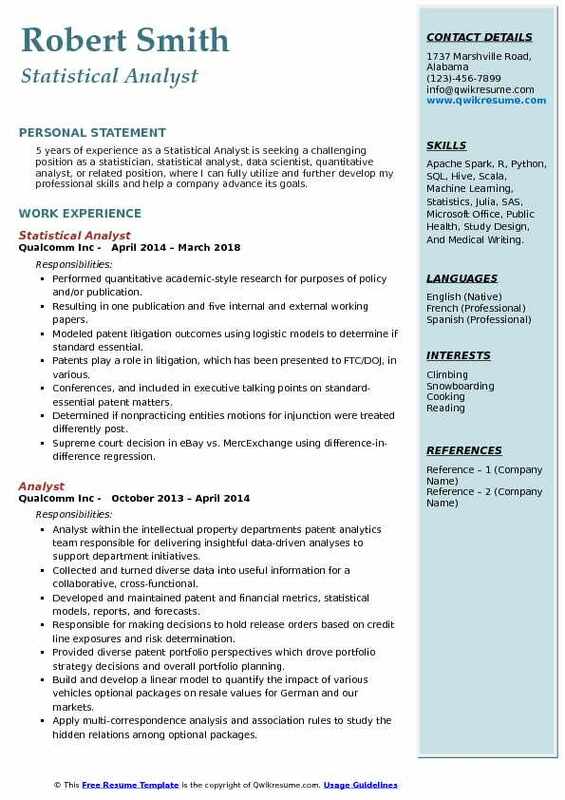 Headline : 5 years of experience as a Statistical Analyst is seeking a challenging position as a statistician, statistical analyst, data scientist, quantitative analyst, or related position, where I can fully utilize and further develop my professional skills and help a company advance its goals. Skills : Apache Spark, R, Python, SQL, Hive, Scala, Machine Learning, Statistics, Julia, SAS, Microsoft Office, Public Health, Study Design, And Medical Writing. Performed quantitative academic-style research for purposes of policy and/or publication. Resulting in one publication and five internal and external working papers. Modeled patent litigation outcomes using logistic models to determine if standard essential. Patents play a role in litigation, which has been presented to FTC/DOJ, in various. Conferences, and included in executive talking points on standard-essential patent matters. Determined if nonpracticing entities motions for injunction were treated differently post. Supreme court decision in eBay vs. MercExchange using difference-in-difference regression. Collaborated with lawyers (internal and external), economists, and external professors to identify key market trends, lack of statistical truths, and misrepresentations in intellectual. Property disputes, patent litigation, and standards in order to model and extract insights. Consulted individuals and teams with statistical and data-related questions, i.e., formulating. Sampling and data pull methodologies, model selection, and extrapolations of results. Constructed in-depth custom statistics research and analytics for internal department use. Objective : 2 years of experience as a Statistical Analyst is looking to obtain a position as a technical data scientist with a focus on machine learning and software engineering. Skills : Excel, JMP, Microsoft Office, SAS, Serial Attached, SCSI, CSS, Deep Learning, Django, ETL, And Forecasting. Involved in managing randomized phase ii and iii clinical trials data. Performed statistical analysis, wrote SAS code for data management and reporting, and performed validation, including testing SAS code. Produced tables/listings for integrated summaries of efficacy (ISE) and safety (ISS). Developed efficacy and safety tables including adverse events table, laboratory shift table, and concomitant medication tables. Generated summary reports, listing using procedures like print, report, means, freq, and tabulate. Communicated with statisticians and bio-statisticians to discuss various SAP related issues and made presentations to discuss various possible changes in it. Wrote programs in SAS to generate reports in creating RTF, HTML listings, tables and reports using SAS/ODS. Attended project team meetings, worked with bio-statisticians, data managers, and clinical research managers as appropriate. Reviewed and provided feedback for data integrity plans. Extensive interaction with the functional users to understand the requirements of statistical methods and measures. Designed flowcharts indicating the input data sets and the techniques that would be used (sorting, merging, etc. ) to get the desired output. 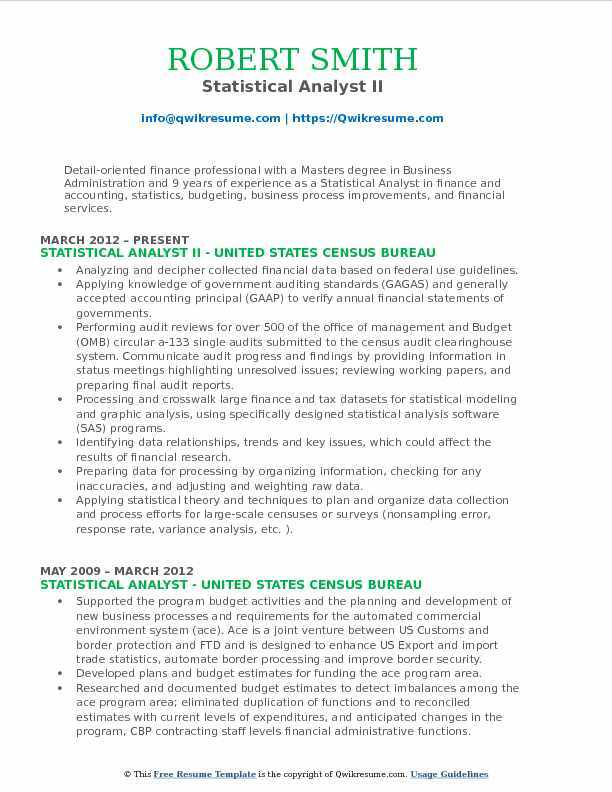 Summary : Detail-oriented finance professional with a Masters degree in Business Administration and 9 years of experience as a Statistical Analyst in finance and accounting, statistics, budgeting, business process improvements, and financial services. Skills : MicrosoftWord, MS Excel, MS Access, MS PowerPoint, MS Project Management, MS Outlook QuickBooks, TurboTax, Statistical Analysis Software, And SAP Business Management Software. Analyzing and decipher collected financial data based on federal use guidelines. Applying knowledge of government auditing standards (GAGAS) and generally accepted accounting principal (GAAP) to verify annual financial statements of governments. Performing audit reviews for over 500 of the office of management and Budget (OMB) circular a-133 single audits submitted to the census audit clearinghouse system. Communicate audit progress and findings by providing information in status meetings: highlighting unresolved issues; reviewing working papers, and preparing final audit reports. Processing and crosswalk large finance and tax datasets for statistical modeling and graphic analysis, using specifically designed statistical analysis software (SAS) programs. Identifying data relationships, trends and key issues, which could affect the results of financial research. Preparing data for processing by organizing information, checking for any inaccuracies, and adjusting and weighting raw data. Applying statistical theory and techniques to plan and organize data collection and process efforts for large-scale censuses or surveys (nonsampling error, response rate, variance analysis, etc. ). Analyzing financial information to recognize and evaluate significant and critical factors to solve complex problems, drawing rational inferences based on statistical data. Preparing comprehensive financial reports, charts, excel spreadsheets, and presentations summarizing statistical findings; clearly explain technical concepts, recommendations, and issues to mathematical statisticians, senior managers, and others both with and without technical backgrounds. Communicating daily with more than 50 data users, data providers, and press reporters via email, phone, and fax; regarding issues, and information on survey results. 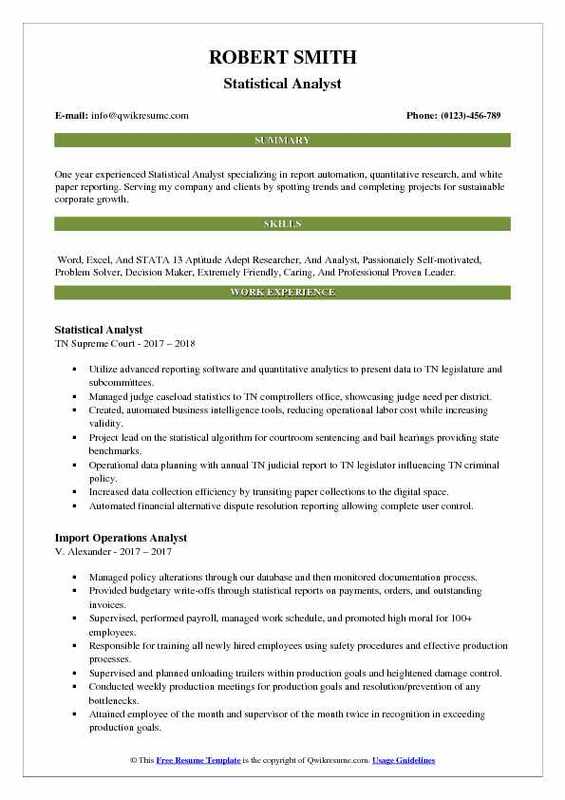 Headline : 5 years of experience as a Statistical Analyst is looking to secure a position where I can provide solutions and value to the business organization, utilizing my Analytical and Collections skills. Skills : SAS, SAP, APO, SPSS, SAP, R3 SQL Server 2005 Business Objects, Forecast Pro, Trac, Cognos Planning, MS Office (Advanced), VBA Automation, Project Management - Meirc Training. Designing and implementing data collection process feeding them into the system for data quality check and data cleansing. Review data in innovative ways and graph the basic statistics for the preliminary internal team discussion. Engaged in the development, interpretation, implementation, and support of several different types of statistical analysis and data mining techniques. Primary report generation of cleaned data and preparation of data for further statistical analysis by group wise for different clients projects. Analyse historical and cross-session trend in the data collected and present the same in graphical and tabular methods to the clients and management. Provide input into the overall strategy and statistical methodologies used to solve quantitative business problems. Research appropriateness and availability of data resources required for each project. Understanding and analyzing seasonal fluctuations in the sales and establish an analytical solution to take advantages of the next possible seasonal period. Application of statistical modeling for the analysis and forecasting of specific business and functional variable aligned with analytical objectives. Liaising with colleagues, clients to implement knowledge-based application and process. Understanding and analyzing product and product consumption issues and recommending an analytical solution. Headline : 10+ years of industry experiences as a Statistical Analyst working on data analysis, predictive model building, development, optimization, simulation, implementation, and validation. Highly motivated with a positive attitude to learn, contribute and share; Great team player with excellent communication skills. Skills : Proficient In R, SQL, SAS, Tableau, SPSS, JMP And Excel VBA. Knowledgeable About Python, Hadoop, Pig, And Hive. Providing exploratory analysis and analytical modeling support to business partners focused on improving sales and marketing, productivity using various statistical and data mining methods. Acquiring, clean, and structure data from multiple sources including Hadoop, Teradata. Analyzing data to identify trends, patterns, insights, and discrepancies in data using r, python, and SAS and conveying ideas with visuals created in SAS, GGPLOT, Matplotlib, Tableau, etc. Using machine learning methods (random forest etc. ) to select important options among vehicles. Applying multi-correspondence analysis and association rules to study the hidden relations among optional packages. Building and developing a linear model to quantify the impact of various vehicles optional packages on resale values for German and US markets. Developing the generalized linear mixed model to identify the key drivers of favorable opinion and quantify the impact of key drivers on fo which is used as a reference for advertisements messaging / product design. Using a nested logit model to quantify the inter-relationship among product, fixed marketing, volume, and price and identify and quantify the key drivers of monetized demand. Study the inference of various factors including macro-economic indices/ competitors strategy/policy change on price and demand, considering multicollinearity and endogeneity problems, to provide implemented data-driven advice on business plan/ price strategy. Develop piecewise linear regression with regulation to quantify the rental impact to off-rental (off-short cycle) off-lease residuals. Apply optimization technique to search the breakpoint of the rental mix and to ensure the pertinent regime of the rental mix.